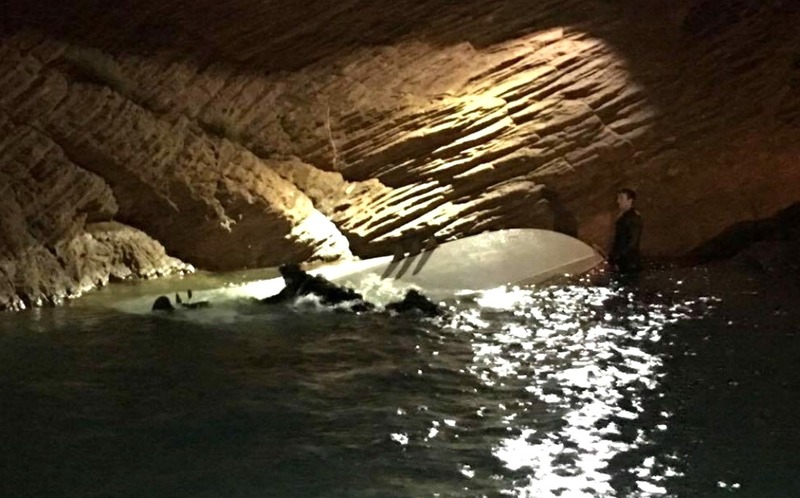 ST. GEORGE — A boat capsized and sank to the bottom of Sand Hollow State Park when strong winds and choppy water changed a church group outing into a rescue operation Tuesday evening. Shortly before 7 p.m. park rangers responded to a call that a boat carrying 12 individuals overturned in Sand Hollow Reservoir when strong wind gusts created large waves and choppy water, Sand Hollow Complex Park Manager Laura Melling said. A group of 11 teenage girls and one woman were boating on the lake during a church outing when the boat was capsized by the high swells. The Washington County Search and Rescue dive team was also called in to assist park rangers in the rescue, Washington County Sheriff’s Deputy Darrell Cashin said. “When we got the call we were told they had a boat capsized with 11 or 12 people in the water over by the jumping rocks,” Cashin said. With rescuers en route several of the teens were able to make their way out of the water on their own while park rangers pulled the remaining individuals from the water and transported them to the shore. Search and rescue team members arrived and with everyone accounted for they remained at the park to retrieve the boat that was now sitting at the bottom of the reservoir, Cashin said. 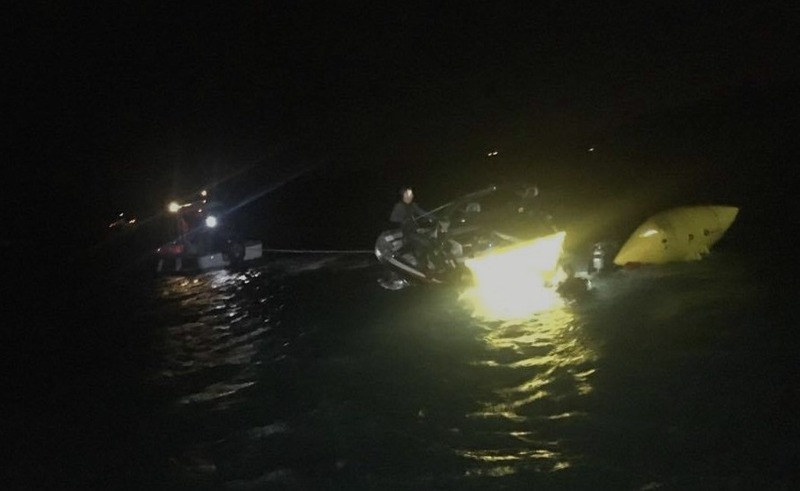 The windy conditions and choppy water continued for nearly two hours, which prevented the team from safely retrieving the boat until the winds died down. Once conditions changed, the team was able to find the sunken boat and use flotation equipment and rigging to bring it to the surface. 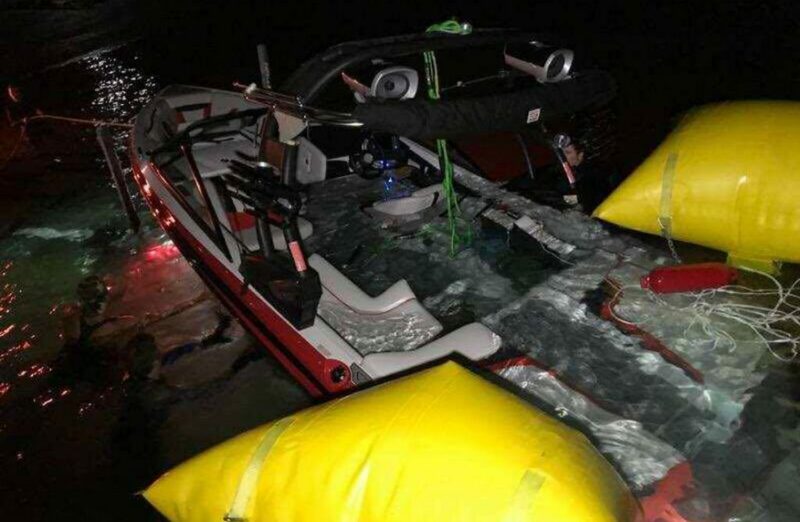 Park rangers then towed the boat to the dock where it was loaded onto a trailer at 11:30 p.m.. The dive team is called out to retrieve boats multiple times a year, Cashin said, and this was the fourth boat the team has recovered just in the last month. The goal is to get the boat out of the water right away, which reduces the environmental exposure of hydrocarbons and other chemicals that can leak from the boat as it sits on the bottom of the reservoir. “We have the equipment and personnel to handle these situations, and when we are called in to assist that includes getting that boat out of the water as quickly as possible,” he said. Cashin also said anyone going out onto the lake in a boat should have a safety vest and to make sure there are enough vests for everyone. If something goes wrong or the weather turns and people are thrown into the water, a safety vest will keep them at the surface so they can be rescued. The quick action on the part of the woman driving the boat in this incident was excellent, Cashin said, adding all of the teens were wearing life vests when they entered the water. “As soon as the weather turned the woman told the girls to get their life vests on, otherwise this incident could have turned tragic,” he said. Afternoon winds can turn blustery fast during the summer months, so checking weather reports before visiting the park is advised. “The winds come on quickly but usually don’t last very long,” Melling said. The park manager also said returning to the dock when winds increase isn’t always a good idea as it can create a backlog of vessels attempting to dock, which still leaves boaters out in open water and that can be dangerous. A safer alternative is to either go to the south shore and dock, or get the boat into shallow water and wait for the swells and wind to subside, she said. “In this incident everybody got off the boat and out of the water safely, and the boat was retrieved from the bottom, and everyone’s safe,” Melling said. Wow! How blessed this group was!